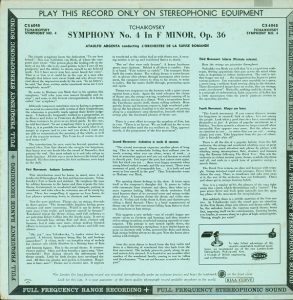 After taking a hiatus from writing my ZD blog, I decided to return with some hopefully useful information for those of you who have been searching on the internet for copies of the increasingly rare and expensive original pressings of the great early Decca, RCA and EMI classical records of the late ‘50’s to early ‘70’s. Particularly the first 5 to 10 years of classical stereo recordings have become harder to find. These include the famed Decca SXL2000 series and many of the early SXL6000 series that followed directly after, the RCA Living Stereo series before dynagroove, the early EMI ASD three digit albums, especially those with the white/gold label, and the sister EMI (Columbia) SAX series, especially those with the blue/silver label. Some of these albums have been reissued in the past couple of decades on typically thick pressings by such companies as Speakers Corners, Testament, High Q, and Alto. 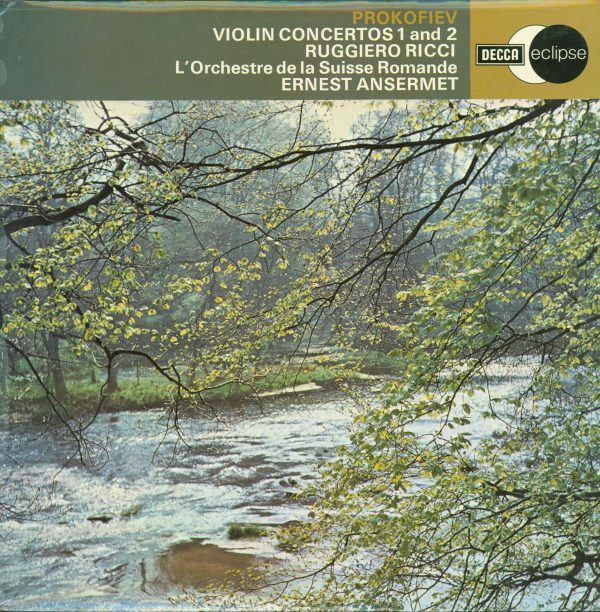 More recently, Analogphonic and Warner Classics have also reissued some of these recordings. Finally, HDTT (High Definition Tape Transfers) is offering very high resolution digital downloads of some of these recordings from some of the best sources available. I will talk about these reissues in Part IV of this blog. Part I will be devoted to the US London original CS and OS series released at the same time as the SXL series and reissues that were done by Decca, beginning just after the end of the beginning of the golden era, that is between the late 1960’s and around 1980. Part II will be devoted to RCA Living Stereo reissues done by RCA and Decca in the ‘60’s and ‘70’s. Part III will be devoted to similar reissues done by EMI. The advantage to these are that all of the reissues were done on midpriced and bargain labels, and many of these reissues are fairly easy to find at prices which are a small fraction of the going price of an original. I will mention briefly the modern reissues which began in the early ‘90’s and continue on to today. The pictures above show the covers, front and back of SXL2005, the Dvorak New World Symphony, recorded in 1956 in Vienna in Decca’s Studio in the Sofiensaal. 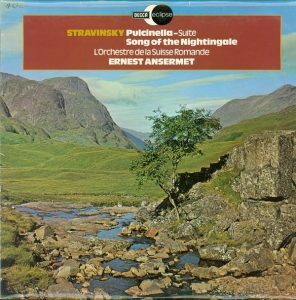 It was produced by the famed Decca producer John Culshaw who went on to produce the Solti Wagner Ring Cycle. The engineer was James Brown. 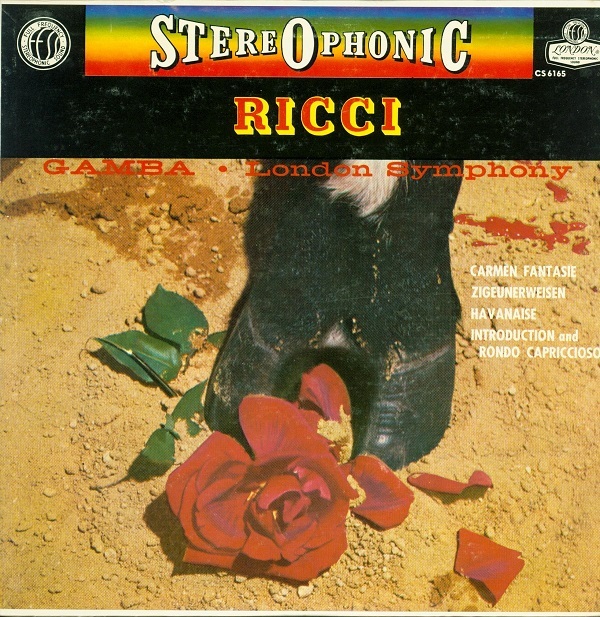 The recording was issued first in stereo in 1958, one of the first Decca stereo releases. 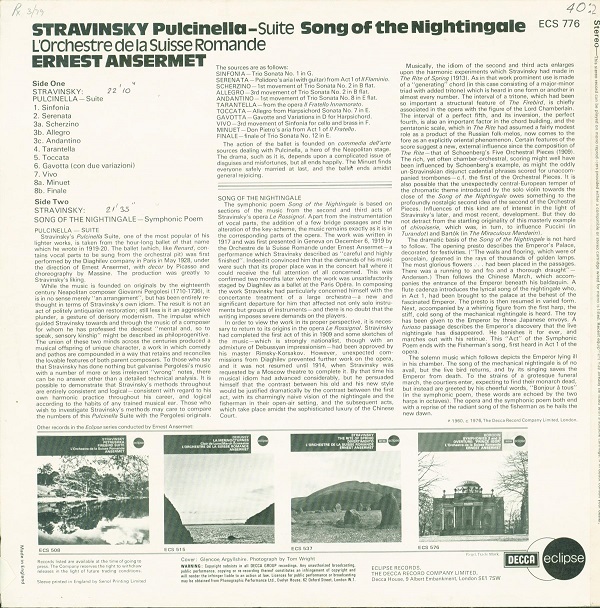 The back cover is typical of the early stereo releases with the narrow blue border around the liner notes. The album has the characteristic folder over the back with a curve at the top and bottom of the back cover. 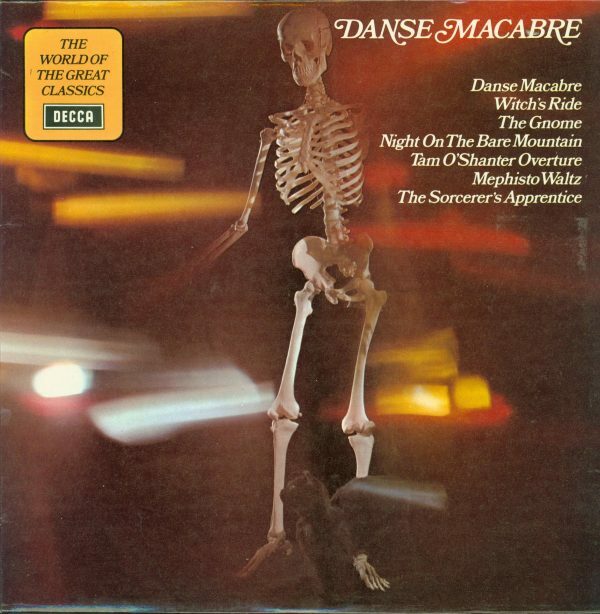 The last album is the first reissue of this album that Decca released about a decade after the initial release. My copy was pressed from an early stamper produced by the same engineer as my earlier pressing. He was Stan Goodall whose letter E is on the dead wax (inner groove area) of the records, at the end of the matrix number beginning with ZAL. Stan did many of the early Decca releases and later went on to become a long time recording engineer. The reissue also has the characteristic groove of the early pressing. Before delving into the different issues and reissues of the original Decca SXL catalogue, I want to mention one additional bargain source. That is SXL issues which continued to be repressed into the late 1960’s, and even 1970’s and early ’80’s. 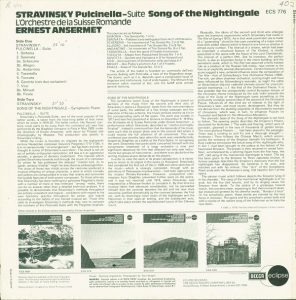 These records maintained their original catalogue numbers (and high original prices) but continued to be repressed in later labels, using the later electronics. Thus you can find some early SXL issues in later pressings, at lower prices. The easiest way to identify them is to look at the designation of the label. Most dealers use the Mikrokosmos label identifier developed by Peter Furop. For the Decca SXL issues it begins with ED1, then ED2 which are both grooved labels with a wide band crossing the label (hence they are also called Wide Band groove). The only difference between the two are that the ED1 label says “Original Recording” in the upper left hand part of the label, and the ED2 label says “Made in England”. The ED1 is the first label and often double the price of a comparable quality ED2 label. An ED3 label has a wide band but no groove and is later still and less expensive. Finally, the last labels ED4 and ED5 have a narrow band across the label and a smaller label with no groove. These are the least expensive. Sometimes you will see an HD1 pressing, which dates from after Decca was bought by Polygram in late 1979 and their records were pressed in Holland. Those records are generally thinner and lower in weight and have a raised rim around the outside edge of the label, sometimes called a Dutch rim. These are normally much less valuable. 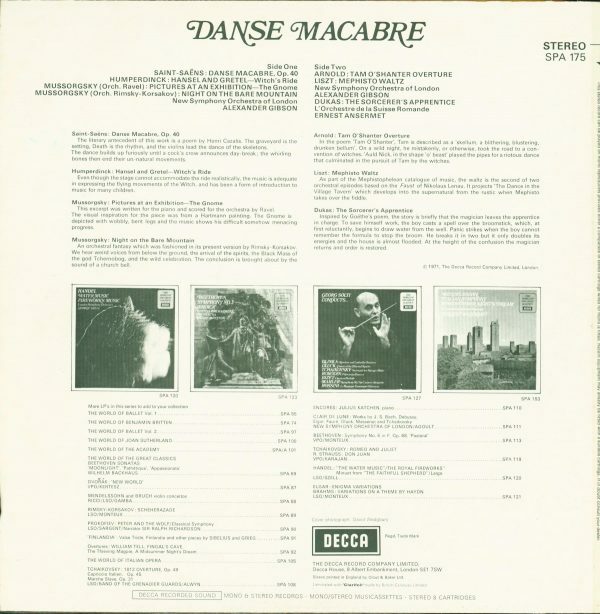 For Decca, I have attached an Excel spreadsheet with the list of SXL catalogue numbers and titles and the corresponding London catalogue numbers and Decca SDD, SPA, ECS, and London STS reissue catalogue number. The spreadsheet link (Decca 65) is directly below. It contains all the Decca SXL records from SXL2001 through SXL6600, where the reissues done by Decca appear to end. With this much data there are bound to be mistakes. If you find one or more, please note in the comments section. London Records was the name for Decca Records in the US. Decca formed a subsidiary in the US before WWII. However, during the war they were forced to sell the subsidiary which kept the name Decca Records. When they reentered the US market after the war, they were no longer allowed to use the Decca name, since their former subsidiary owned it. They decided to name their company London Records in the US. The London releases were all pressed in the UK or Holland in the same presses as the Decca recordings, with the same stampers. My experience with London and Decca records with the same stampers is that they are either identical in quality or sometimes the Decca is very slightly better. The difference is smaller than the difference between records made with different stampers. Because of the higher volume of sales in the US, the London versions of the records are almost always found more easily and are significantly cheaper in the used record market. One possibility of the reason of the sonic quality between the two may be the following. Since for most of the records, the same stampers were used in pressing both the Decca and London versions of the record. If one does not look at the label, the records look identical in all respects. It makes sense that during the press run of say 1500 records that if 500 were destined to be Decca for sale in the UK and 1000 to be London to be sold in the US, that one group would be done before the other, since it makes no sense to change the labels back and forth during a run. If the Decca records were normally pressed first, being a smaller number of records destined for local sales, then the Decca labelled records would benefit from stampers earlier in their run with less wear than records pressed later in the run (until it was determined that the stamper was too worn to make acceptable copies.) Then Decca labelled records would generally be pressed from less worn stampers than London labelled records from the same stampers. If two records were stamped near the point of the change over in label, then they should be coming from a time when both records were pressed from a stamper of the same amount of wear. Hence, either the Decca would be better or about the same as the London. Finally, there are many full priced London issues which were never issued as Decca issues. For a few, it appears that the recording was aimed at the US market, but for most it appears that the distribution people at Decca made decisions that either the album would not sell well in the UK. Often these full priced London recordings were given a full priced Decca catalogue number – SXL but then not released except as a full priced London CS or OS album. 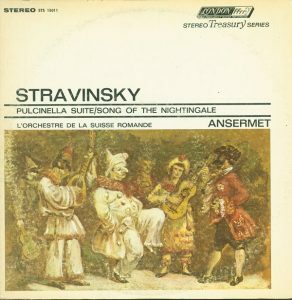 These recordings, particularly from the early stereo era would eventually be released as a bargain label. 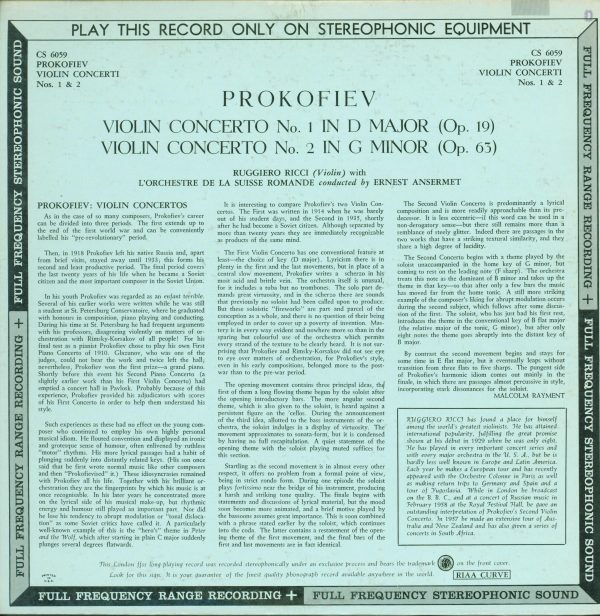 One example is the Prokofiev Violin Concerti performed by Ruggerio Ricci with Ansermet conducting (London CS6059) which was released in 1959 after being recorded in 1958. It had been given the Decca SXL2036 catalogue number but was not released until 1974 in the UK when it was released on the bargain Decca Eclipse label as ECS746. Another similar example is the Borodin Symphonies album by Ansermet (London CS6126) one of the earliest stereo recordings by Decca done in 1954 and released in 1959 for the US only. It was finally issued in 1971 in the UK again under the Eclipse label ECS576. In both cases the recordings in their Eclipse label were chosen as Super Discs by the Absolute Sound and later their original London versions were recognized. 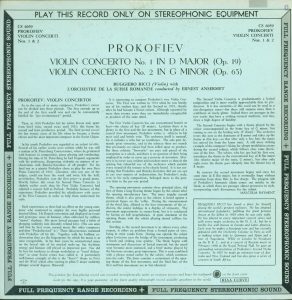 Below are the front and back covers of the Prokofiev Violin Concerti in its original London release (a blueback cover) and the later Decca Eclipse issue. Another difference is that the cover art is different. Records were pressed in the New Malden plant in the UK and shipped to the US in bulk, without covers. The covers were designed and printed in the US and the records were assembled in the US. My artistic sense generally favors the Decca cover art over the US versions, particularly for the earlier releases, when US cover art typically features photographs of objects and people in costume versus the drawing on the Decca covers. The catalogue numbers are also different, with the first London recordings starting with the number 6000, instead of 2000. There are also two prefixes for the London records, CS is the most common, with OS reserved for records and box sets which have vocal content, both soloists and choruses. While Decca began releasing multirecord albums in boxes in their SET series, while began in late 1960, London kept its boxes with the same numbering as the single records, adding an “A” to the letters, CSA and OSA, for instrumental and vocal recordings respectively. The record labels for London followed a similar pattern to the Decca records, with wide band grooved labels followed by wide band non-groove, followed by narrow band labels. 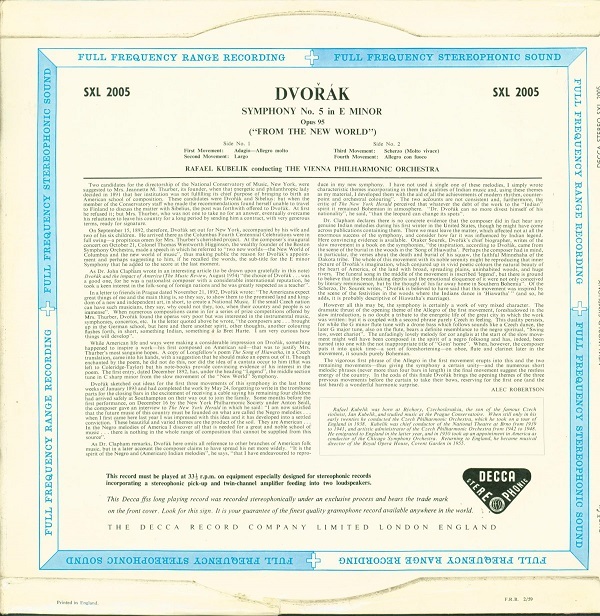 One distinguishing identifying marking for the earliest London releases is the distinctive blue back cover. One often sees the “BB” or “bb” identifier for an early London release, almost always with a higher price. Of course, since covers can be exchanged, a BB cover may not be an original cover. 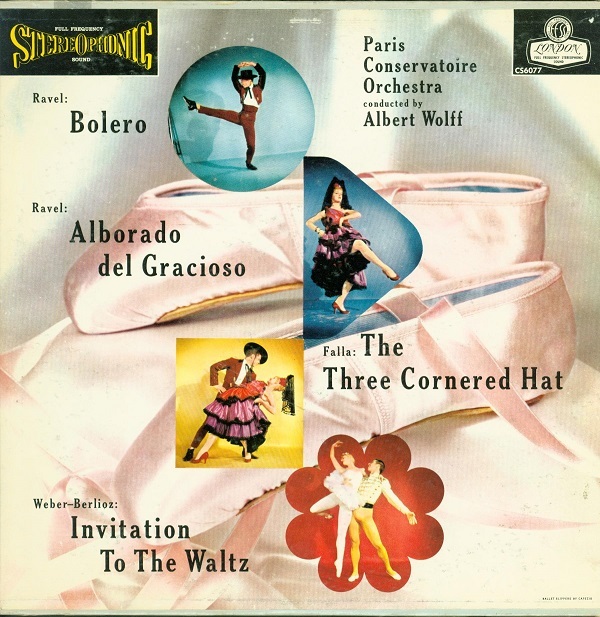 The SDD series began in the late 1960’s and was a stereo version of the Decca Ace of Clubs series which featured reissues of early Decca mono LPs. The SDD series consisted of two major types of issues. First, and the one we will focus on here, are the reissues of the early Decca SXL2000 and SXL6000 recordings, which were issued beginning in 1958 at full price. The SXL2000 series records in their original wide band groove label (a thin groove around the outer part of the label) and the words “Original Recording” around the outer edge of the label and a wide silver band across the center of the record (often called ED1 from Peter Furop – Mikrokosmos – catalogue) are pricey to extremely pricey today. Even later pressings, the ED2 with the same wide band groove, but the words “Made in England” can be expensive, and the wide band without a groove ED3 label “Made in England” wording are not cheap. Many of the SDD series (most of the numbers from 100 to 199) were first issued using stampers from the original issues – that is with a wide groove around the label. They continued to be reissued with later stampers with no grooves and these labels were also smaller in diameter. The later labels were the ones found in the all the SDD series to the end of the series. Issues that were not reissues of the SXL series were recordings that Decca made but chose not to release on the full priced SXL series. In addition to the SDD prefix, Decca also released on the same Ace of Diamonds series, box sets with a GOS (Grand Opera Series) prefix. These included some SXL reissues, sometimes squeezing an original 4 record set into 3 records (longer sides than the original, not a condensed version) or 3 record originals into two records. 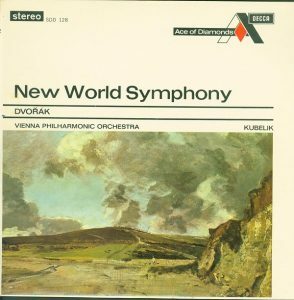 Interestingly, some of the very earliest stereo opera recordings were made in Belgrade in then Yugoslavia. 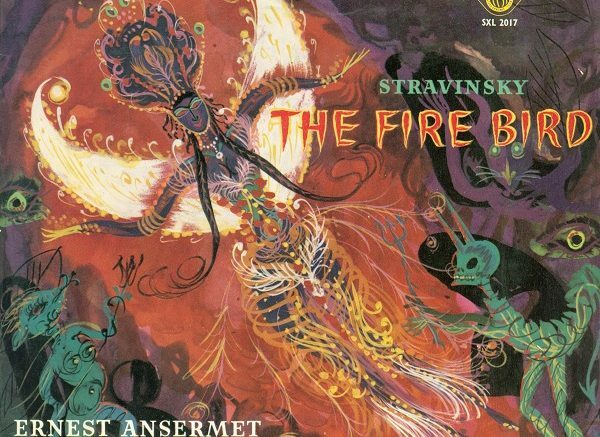 They were primarily of less well known operas by Russian and some eastern European composers. They were released in stereo in the US in full priced versions in the late 1950’s and early ‘60’s, but not in the UK until Decca reissued them as part of the GOS series a decade or more later. Ace of Diamonds releases were called mid-priced by Decca, that were typically about 2/3rds the price of the full priced SXL series. 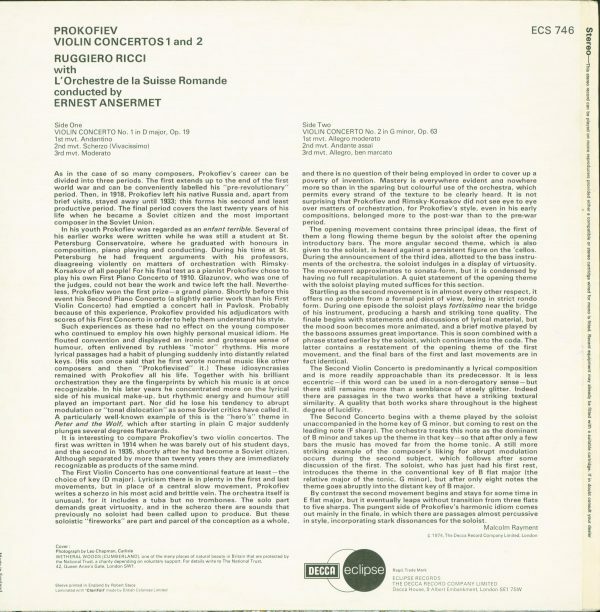 The ECS series was primarily composed of reissues of mono Decca classical albums that were reissued in electronic or fake stereo. 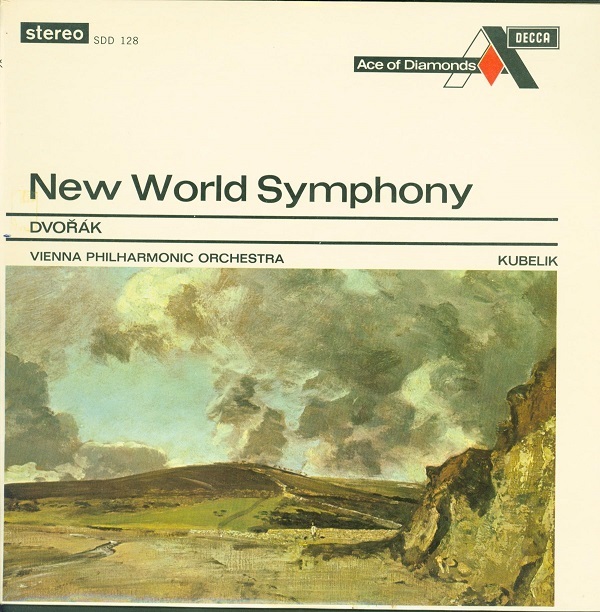 They were reissued to take advantage of the growth in home stereo equipment to extend the market life of the extensive catalogue of mono recordings. The fake stereo recordings should be avoided. The original mono recordings were passed through filters which separated the high frequencies from the low, placing most of the highs in the left channel and most of the low in the right channel. 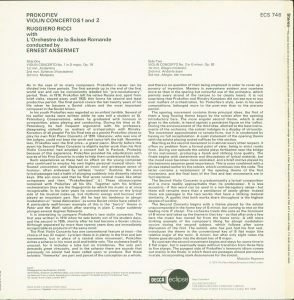 The ECS series with fake stereo can be easily identified by the description on the back side of the album cover running parallel and next to the spine. 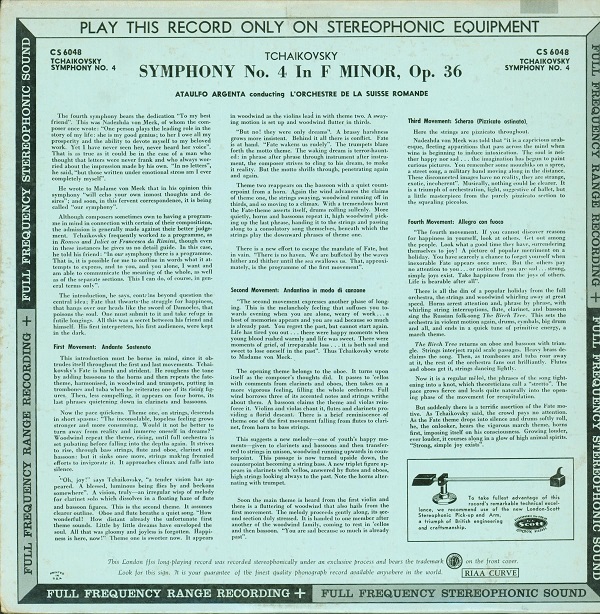 In small print the record is identified as electronic stereo. However, there were many ECS series recordings where were in true stereo, again identified by the small print on the back side of the album running next to and parallel to the spine. Many of the true stereo ECS records were first time Decca releases including reissues from earlier releases on other labels. 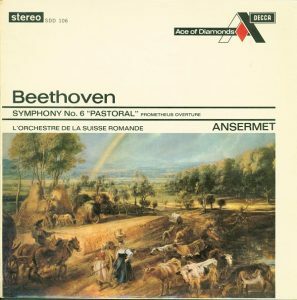 Some of these were stereo recordings made beginning in 1954 in parallel to the standard mono versions. In general, they were considered experimental by Decca and not released, even beginning in 1958 when Decca first released stereo recordings. A few others were reissues of full priced stereo recordings from the SXL series. An additional group were stereo recordings that were made in the early years of stereo – 1954- 1960, but were not released in the UK. For example some of these recordings were released in stereo in the US beginning in 1958. Finally, a fairly large number were releases of RCA Living Stereo recordings which will be discussed in further detail in part II of this blog. The attached spreadsheet includes a column with many of the ECS reissues of the SXL series. Some are marked with the letters “sim” which indicates that the contents are similar, but not identical to the earlier issue. Often an extra piece, typically from the same recording session which was not included in the original release, is added to the ECS reissue. A third series issued by Decca is the bargain priced SPA series. Most of these recordings were never issued in full priced form, but a few contained contents derived from full priced SXL and the RCA Living Stereo series. Most of the SPA series used excerpts from the original full price contents or otherwise modified the original contents. For example, SPA175 features the entire contents of the famous RCA LSC2225 “Witches Brew” engineered by Decca but adds one additional piece. At around 10GBP it is a great bargain compared to an original LSC2225 which is priced around $500US or more. The spreadsheet also includes a number of SPA issues that contain parts or all of the full priced Decca SXL issues. The London Stereo Treasury series was a very broad bargain priced series issued in the US, but pressed in the UK (with very few exceptions) at New Malden. 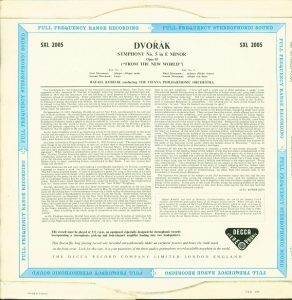 It duplicated many of the Decca SDD series as well as other lower priced Decca original issues, such as the Decca HAYDN series of the complete symphonies, string quartets and piano sonatas of Joseph Haydn. Like the SDD series it included reissues of original SXL series recordings, sometimes using original stampers (with the tell tale grooved labels). These were originally issued at $1.98 per record, when full priced London recordings were $5.98 or more. They increased in price over time, but were always at bargain prices. Like the SDD series, the STS recordings also included albums that were not issued at full price and made their first and only appearance as bargain or mid-priced albums. STS records are very easy to spot, since they have a uniform cover design, over all white with horizontal black stripes and smaller cover art. 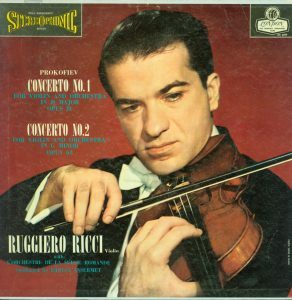 The main reason for Decca and London reissuing their full priced originals was economic. 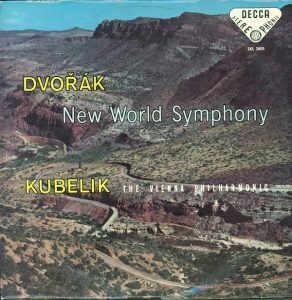 Unlike pop music, classical albums tended to have much longer sales lifetimes. So a record that was issued in 1960, unlike its pop counterpart, would generally not have as great an immediate sales, but would still be in demand a decade later. However, toward the end of its sales life, the demand would drop off and the record companies would have to take the records back from the dealers (returns). Many of those were resold after some mutilation of the covers (so called cut outs) and even drilling through the label area of the record, so they were clearly not returnable as new full priced. The reissues allowed the record companies to extend the sales life of the albums. Records would also find a new audience, including those who had not seen the original release or could not afford it at the time. Reissues also kept the expensive presses at New Malden busy and typically, more records were pressed out of each stamper which prolonged the life of the stamper. It also typically lessened the playback quality of the record if it came from toward the end of the stamper’s life. Decca also changed from tube based electronics to transistor based electronics during the ‘60’s, so that most of the reissues were from the transistor based era. However, some of the reissued albums with the grooved labels did come from stampers from the earlier tube era. 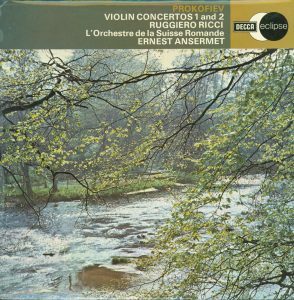 Be the first to comment on "Blog 18 Cheap(er) Alternatives to Expensive Early Pressings of Decca, RCA and EMI Classical Records Part I Decca"